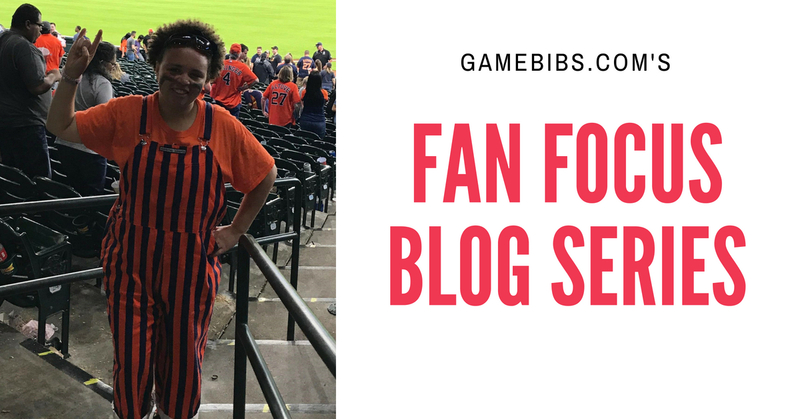 Our guest for the fifth installment of our Fan Focus blog series is Kristina, a die-hard baseball fan from Houston! Read on to find out more about Kristina. When did you buy your first pair of Game Bibs? I got my first pair when I was in 8th grade. I still use them today for my high school football games and for University of Houston college baseball games. Do you have any game day traditions (tailgating, specific foods, etc.)? Usually for the Astros games, hang with friends about 1-2 hours before the first pitch, then head to the bullpen after the first half inning and hang there in hopes of having a good five innings before heading to my seats. What song gets you pumped up on game day? Seasons before, I usually listen to Jason Alden. After winning the World Series last year, one song that always gets me pumped this year, along with Jason Alden’s music, is “World Series Grillz” by Paul Wall. Name three game day necessities you always have with you. I carry more than three items in my Nike backpack. I carry my glove to catch some baseballs during BP and/or games, a bottle or two of water to keep myself hydrated on days when the stadium is open and when there is a big festival on Crawford Street, my charger (if it’s going to be a long day worth of college baseball tournaments at the stadium), a baseball and some cards if I want to get something signed and a couple of Sharpies. What's your favorite game day memory with your Game Bibs? That’s tough, but I would say either Game 7 of the ALCS against the Yankees or Game 4 of the World Series. I know we lost Game 4, but I went with a cool friend of mine who also is a big Astros fan and is a local sports broadcaster here in Waco, TX. If you could wear any article of clothing in the same colored stripes as your Game Bibs, what would it be? It would be between orange and navy pants or shoes because nobody at Minute Maid Park wears cool pants or shoes with stripes. Tell us about a favorite sports moment you've gotten to experience. I grew up as an Aggie, which I always tell people is why I have really strong lungs. My favorite memory was back in ‘06 when I was six years old, I went to the The AT&T Corps Classic between A&M and Army. At the last two seconds of overtime, I had to use the restroom and my mom was really mad. Till this day, I never have to go at the last minute during any event. Do you have any big plans for this year's football season? Hopefully attend a few U of H games this season. Of course, The Sandlot. It’s a baseball classic and will be a classic, FOR-EV-ER. It’s tough to choose just one, but if I had to choose two active players and two legends, they would be Nelson Cruz or Chris Devenski and Jose Cruz or Chipper Jones. Thanks so much for taking the time to chat with us, Kristina, and best of luck to Houston's sports teams in the upcoming months! Want to be included in our Fan Focus blog series? Contact us on Facebook or Instagram!